There are multiple benefits to learning new things, no matter what it is that you’re studying. Whether it’s for business or personal reasons, there are learning opportunities all around you. From something as difficult as a new language to something as simple as making pancakes from scratch, every day presents a new chance to broaden your horizons. 1. It rewires your brain. Studies have shown that whenever something new is learned, fresh connections can form between neurons. This phenomenon is known as neuroplasticity – the ability of the brain to change throughout life. 2. It can help fight dementia. Experts say that learning new skills is one of the best ways to help ward off dementia. In the same way that physical exercise helps keep your heart healthy, mental exercise helps keep your brain in shape. Anything that challenges you to think about things in a new way, from crossword puzzles to learning to crochet, can help keep your mind fit. 3. It may improve your memory. Just like you can train your body to run an 8-minute mile or do a perfect squat, you can train your mind to remember things more efficiently. Learning new skills – especially when you share that knowledge with others – helps flex your memory muscles. The simple act of learning something new, and then repeating it, helps improve your overall recall. 4. It can help you learn faster overall. As you build your internal database of knowledge, it becomes easier and easier to learn new things. This is because many skills are interconnected, and build off each other. For example, if you learn how to make homemade pastry dough, it will then be easier to learn to make turnovers, tarts, and pies, since pastry dough is the foundation for each. 5. It makes you a more productive person. This one is simple: the more you know, the more efficiently you can operate. Say, for example, you work in IT. You need to constantly keep up with the latest technology in order to do your job properly, or you’ll quickly fall behind. 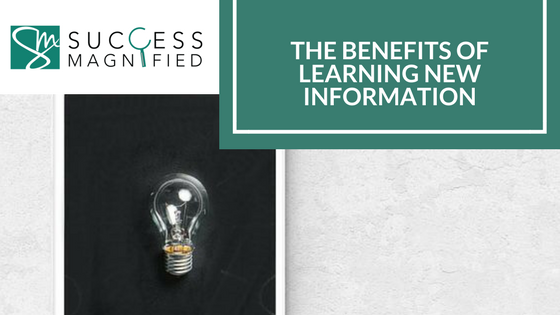 Regularly learning new skills will allow you to do your job more quickly and easily, rather than taking the time to look up the necessary information every time something pops up. 6. It can increase your understanding of others. Every new skill you learn makes you a more well-rounded person. It creates more common ground and helps you to relate to a larger number of people in general. This can come in handy in a variety of situations, from hunting for a new job to trying to land a date. The more you can understand and empathize with others, the better all your relationships will be. Last, but certainly not least, learning is exciting. The next time you’re sitting around mindlessly scrolling your Facebook feed, think about what you could be doing instead. Pick up a book. Take a walk. Go chat with someone at the coffee shop. Whether you realize it or not, even the simplest everyday tasks can present learning opportunities! You never know what you’ll find when you venture out into the world. Make it your mission to learn something new every day! It will expand your horizons and make you a happier, healthier person.